Green is Mum's favourite colour and just had to add the butterflies. I've put some of the flowers on acetate stems so they wobble. Very pretty, sure she will love it. Bet she'll be pleased with that, it's gorgeous !! Brilliant. How did you find the instructions. pretty easy eh? That is fantastic, Cath - fabulous for a first attempt, too. I'm sure she'll love it. Awww, that's just lovely Cath. She'll be well pleased with that. That will be a lovely surprise when she opens it up, would love to see her face. A lot of work in that. Lovely card Cath, bet she was really pleased with it. Mum loved her card as did my sister in law who called after I'd left. 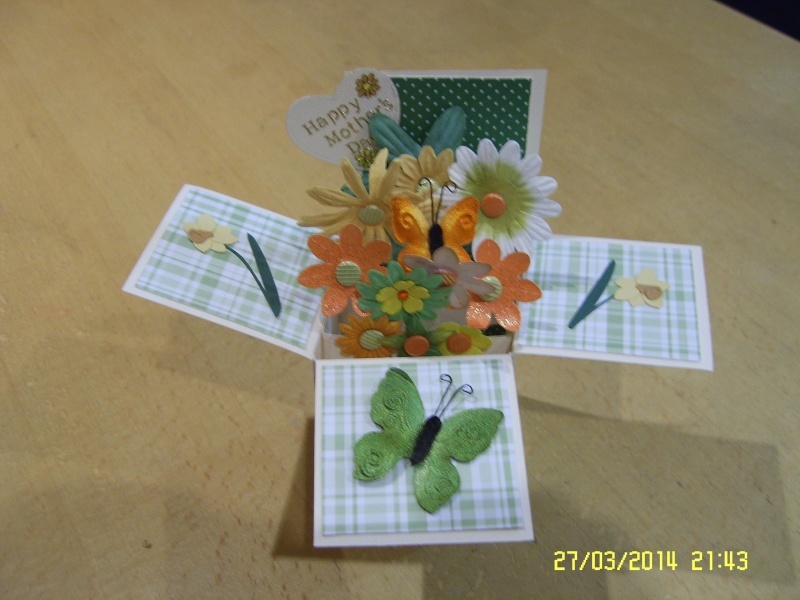 Looks fab, I did my Mum a pop up card too, they are easier to make than I thought they'd be.